The Cocker Spaniel is clearly the best dog in the world. A sweet and gentle dog that loves company and does not like to be alone for too long. When they’re not retrieving things, Cocker Spaniels make great family pets and like lots of exercise and mental stimulation. The Cocker Spaniel is also extraordinarily handsome. 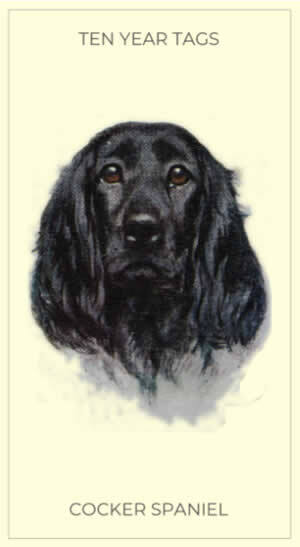 Buy Your Cocker Spaniel a Deeply Engraved Solid Brass Dog Name Tag Today! Especially when work by a Cocker Spaniel. Hand-made with vintage aircraft manufacturing tooling (that’s the dog name tag, not the Cocker Spaniel) and GUARANTEED to last you Ten Years.